Photos taken with a 6x7 medium format camera after the World Trade Center attacks in 2001. Waiting for the ceremony to begin for the one year memorial of the September 11 attacks in lower Manhattan, September 11, 2002. 6×7 medium format film scan. Press wait outside the court house in New York City for sentencing of four followers of Osama Bin Laden who were convicted for the bombing of the US Embassies in Kenya and Tanzania in 1998. The sentencing was to take place on September 11, 2001, but was postponed when the World Trade Centers were attacked. October 18, 2001. 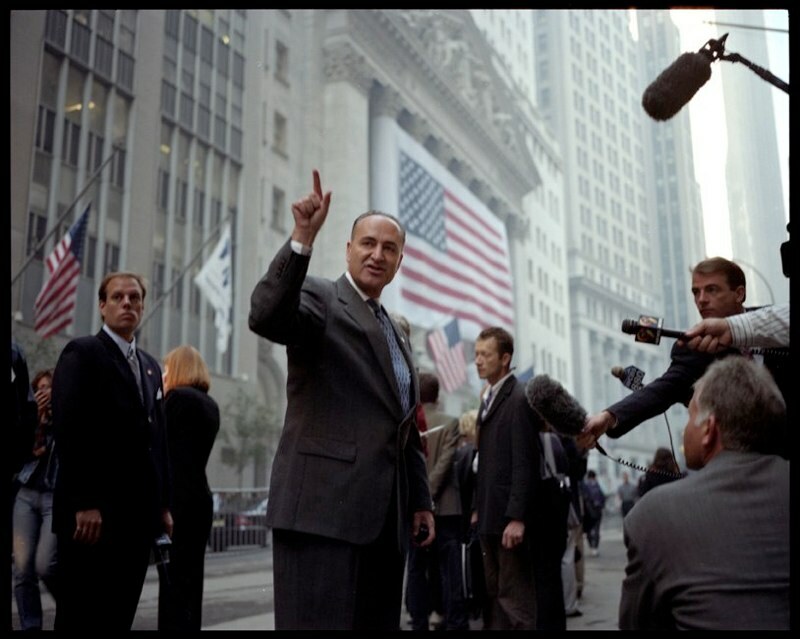 Senator Schumer addresses the press at the reopening of the stock market in lower Manhattan on September 17, 2001 after the attacks on the World Trade Center on September 11, 2001. Police check ID’s on Wall Street in lower Manhattan when it reopened on Monday September 17, 2001 after the attacks on the World Trade Center on September 11, 2001. Makeshift memorial outside firehouse in lower Manhattan, September 17, 2001. Woman is led away from the collapse of the World Trade Center towers in lower Manhattan, September 11, 2001. Man walks from the collapse of the World Trade Towers n lower Manhattan, September 11, 2001. Two men walking away from the collapse of the World Trade Center towers in lower Manhattan, September 11, 2001. Woman on Broadway runs from the collapse of the first tower in lower Manhattan, September 11, 2001. People sitting on stoop in lower Manhattan after the collapse of the two World Trade Center buildings, September 11, 2001. Cloud of dust over the Woolworth building in lower Manhattan after the collapse of the two World Trade Center buildings, September 11, 2001.